As many of you know I have produced an ABAP Video training course that many people have purchased and sent me tremendous feedback on. 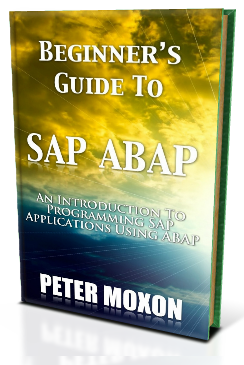 Well, after a lot of hard work I have turned that course into a brand new BEGINNERS GUIDE TO SAP ABAP book that you can get FREE from the 12th December 2012 for 5 days. I want to say thanks to everyone who visits to website and this free book is my way to say just that. Feel free to pass the download link to anyone you wish. The more people that can benefit from the book the better. For those that don’t have a Kindle, No Problem – You can get the Kindle app on your Phone, Tablet,PC or Mac. Click this link and choose your preferred app. If you like the book, I would love it if you could leave a review on Amazon. Not able to download the free book. I just see a few pages when i click on the link. Hi, I’m in mainland, China . I can’t get the kindle edition, could you provided a link? The book is only available through the Amazon kindle store at the moment. I will update the website when it is available in other formats. Hi, I’m not able to download the book via my amazone account. Sorry to hear you can not get the book. I don’t know what the issue could be as Amazon control everything. The book is only available on Kindle at the moment. Even though you don’t have a Kindle you can still use the Kindle reader for your PC or Mac. Just follow the link in the article above. Could you please send the link to download, as I dont have kindle. I already download your book. since I live in Austria and have an austrian account at Amazon I can’t this book for free. Each time I try to download it I’m being redirected to the german Amazon site and (as far as I know) there is no option to get it for free. Is there any chance to get this book in other way? The book is only available via kindle. During the 5 day promotion you should have gone through the purchase process at Amazon. This would then have given you the full book, not just the preview. Unfortunately the promotion period has now closed (Amazon only allow 5 days promotion maximum). I tried unsuccessfully downloading the book 2 times during the 5 day period but was directed by Amazon for payment. is there some other way to get this? Amazon is the only place to get the book at the moment. Can you upload video related to creating Tab strip and table control ? Can U provide Webdynpro ABAP Book?